There is nothing more inspiring than setting a goal and achieving it. The goal needs to be a stretch, preferably something on your bucket list. For many, running a marathon (26.2 miles) is one such bucket list item. Unimaginable? Unthinkable? Not really. Before I ran my first marathon, I was afraid of the thought of it. 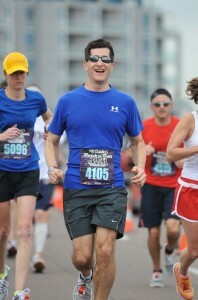 Crossing the finish line of my first marathon was one of my peak experiences. While it was something I’ve always wanted to do, I kept coming up with excuses not to do so. I was concerned the training would take up too much time from my family. When I expressed this concern to my wife, she gave me her blessing. “Go for it! We’ll be fine.” No more excuses! As it turns out, there is no more efficient way to exercise than running. You can do it any time, while at home or on vacation. It requires no special equipment or transportation. You can run for 10 minutes or 4 hours. I have found running to be the ideal exercise: it burns lots of calories, and clears my head when I am stressed. I never would have predicted 11 years ago that would have run 9 marathons. The hardest part is committing to do it. No more excuses! Begin a couch to 5K program. These programs get you to a 5K in 9 weeks, even if you can’t run a wink. You can download a plan to your smartphone (search C25K or couch to 5K), or visit one of the many web sites. Here is a great one. Don’t worry about speed. The most common error beginning runners make is to go too fast, causing them to tire out. You’re not trying to be Usain Bolt. Commit. Once you have worked up to a 5K (3 miles), you are ready to register for your first marathon. Registering gets you committed, and give you a reason to train. Get a marathon training plan. My favorite is “The Non-Runner’s Marathon Trainer,” by David Whitsett et al. It will get you to full marathon ready in 20 weeks. This plan has been used by thousands who didn’t think they could do it, and did. The stories and tips are invaluable. Set a goal. Commit. Find a plan. The six months you spend is a model for life. Wach step gets your to your goal. Each run is made of thousands of steps. Each run builds on your last one. Go for it, and fear not. You’ll find the experience one of the most life’s most rewarding ones. Robert Ziltzer, MD is a weight loss physician in Scottsdale, AZ and one of our ATLX Experts. He has completed 9 marathons, and is a cyclist and swimmer. As a board certified Obesity Medicine Specialist, he helps serial dieters achieve long term weight loss and fitness success.